The thoracic wall is composed of the 12 thoracic vertebra, 12 ribs and costal cartilages, sternum and associated muscles. The external, internal, innermost intercostal muscles, intercostal vessels and nerves lie in the intercostal spaces. All three are thin sheets of muscles whose fibers run from one rib to the next. The external intercostal muscles begin posteriorly, lateral to the tubercle of the rib, and extend anteriorly, past the costochondral junction. Between the costal cartilages, the muscle is replaced by the external intercostal membrane. The fibers slant downward and forward from one rib to the other. The internal intercostal muscle fibers run in the opposite direction, upward and forward from the upper border of one rib to the lower border of the next one. The muscle fibers of this layer reach the sternum anteriorly. Fig. 1.1. Anatomical structures of the breast and underlying chest wall. Reprinted with permission from: Bland KI, Copeland III EM, eds. The Breast: Comprehensive Management of Benign and Malignant Diseases. 2nd ed. 1998; 9-36. ©1998 W.B. Saunders Co.
Posteriorly, they extend only as far as the costal angles and continue as the internal intercostal membranes. The innermost intercostal muscles lie internal to the internal intercostals and occupy chiefly the middle part of the length of each intercostal space. They are less well developed and are separated from the intercostal muscles by the intercostal nerves and vessels. The subcostal and transversus thoracis muscles are located on the internal surface of the thoracic wall. The subcostal muscles are variable fiber bundles posteriorly placed that span two to three intercostal spaces. The transversus thoracis is a thin layer of muscle whose fibers arise from the posterior surface of the lower part of the sternum to the neighboring costal cartilages. The thoracic wall is innervated by the ventral rami of T1 to T12 spinal nerves. T1 to T11 are the intercostal nerves, and T12 is the subcostal nerve. These nerves innervate all the muscles and give branches to the overlying skin as lateral cutaneous nerves. 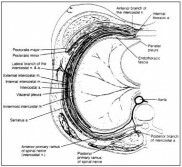 The upper six terminate as the anterior cutaneous nerves, superficially. The lower six terminate as the thoracoabdominal nerves, innervating the anterior abdominal wall. The nerve lies below the vein and artery. In each intercostal space, there are two sets of intercostal arteries, posterior and anterior, that anastomose with each other. Fig. 1.2. Arterial blood supply to the breast. The main blood supply is from the internal mammary artery and lateral thoracic artery. Reprinted with permission from: Bland KI, Copeland III EM, eds. The Breast: Comprehensive Management of Benign and Malignant Diseases. 2nd ed. 1998; 9-36. ©1998 W.B. Saunders Co. The posterior intercostal arteries, except for the first two spaces, are branches of the descending thoracic aorta. The first two originate from the supreme intercostal artery that is a branch of the costocervical trunk of the subclavian artery. The upper five anterior intercostal arteries are branches of the internal thoracic (mammary) artery. The lower six arise from the musculophrenic artery, one of the terminal branches of the internal thoracic. The intercostal veins follow similar patterns. The first two anterior intercostal veins drain into the brachiocephalic vein and the remainder into muscolophrenic and internal thoracic veins. The posterior intercostal veins drain into the azygos and hemiazygos veins. Figure 1.3 is a cross section of the breast and chest wall illustrating the layers of the thoracic wall and paths of blood vessels and nerves. Table 1.1 lists muscles of the chest wall that comprise the anatomic boundaries of the axilla, their origin, insertion, action and nerve innervation. The nerves are discussed in the section on the brachial plexus. Fig. 1.3. Cross section of the breast and chest wall. The intercostal muscles occur in three layers. The intercostal vessels and nerves pass between the internal and innermost layers. Reprinted with permission from: Bland KI, Copeland III EM, eds. The Breast: Comprehensive Management of Benign and Malignant Diseases. 2nd ed. 1998; 9-36. ©1998 W.B. Saunders Co.
Cases of complete or partial absence of the pectoralis major have been reported on occasion. Most commonly, congenital absence of the sternocostal head of the pectoralis major has been noted as an anatomic variant. The pectoralis minor may or may not be absent when the pectoralis major is absent. The pectoralis minor inserts into the head of the humerus as well as into the coracoid process of the scapula in 15% of cases. Variations in the origin from the latissimus dorsi have also been reported. The latissimus dorsi can cross the base of the axilla superficially and pass deep to the pectoralis major muscle to join its insertion or to continue to the coracoid process. This is called a Langer’s axillary arch, and can cause compression of the axillary artery or difficulty in orientation during axillary dissection. This has been noted in approximately 3-6% of cases. Pectoral region, axilla and shoulder. In: Rosse C, Gaddum-Rose P, eds. Hollinshead’s Textbook of Anatomy. 5th ed. Philadelphia: Lippincott-Raven Publishers, 1997: 193-238. Gray H. The lymphatic system. In: Clemente CD, ed. Anatomy of the Human Body. 30th ed. Philadelphia: Lea and Febiger, 1985:866. Osborne MP. Breast development and anatomy. In: Harris JR, Lippman ME, Morrow M, Hellman S, eds. Diseases of the Breast. Philadelphia: Lippincott-Raven, 1996:1-14. Romrell LJ, Bland KI. Anatomy of the breast, axilla, chest wall, and related metastatic sites. In: Bland KI, Copeland III EM, eds. The Breast: Comprehensive Management of Benign and Malignant Diseases. 2nd ed. Philadelphia: WB Saunders Co., 1998:19-37. Petrek JA, Blackwood MM. Axillary dissection: current practice and technique. Curr Probl Surg 1995; 32:259-323. Rosen PP. Anatomy. In: Rosen PP, ed. Rosen’s Breast Pathology. Philadelphia: Lippincott-Raven, 1997: 1-15.